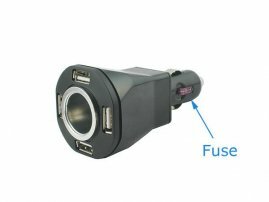 5-in-1 Auto Charger - 4-Port USB Car Charger and 1 Lighter Socket [OC000556] : Onchee.com - the accessory shop for all your handheld Electronics! Wheelchair Rail / Tube / Pole Clamp Mount with 360 deg Rotation Security Lock for iPad Pro 11.0"
If you have GPS, iPhone, iPod, MP3... all the deviece relying on the USB Port to provide power to you, what you can do if they need rejuice at the same time. - The 4 USB charger sockets are very well located (not in an array) that you will not have difficulties to plug and unplug.